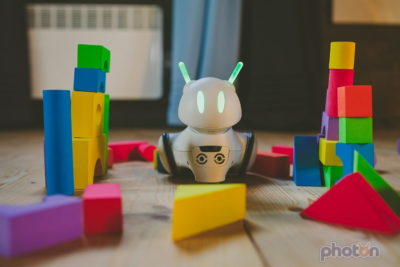 BIALYSTOK, Poland, 10.05.2016 – Photon Entertainment announced a crowdfunding campaign for Photon – world’s first interactive robot that grows up with children while teaching them programming. The campaign is launching on May 31st and will take place over the course of six weeks. Price ranges from $149 for a super early bird version to $199 for a regular one. Stretch goals include backer exclusive accessories for the robot (such as a jetpack or mouth allowing for speech visualization) as well as donations for various child related charities (cancer wards, orphanages and others). Photon is a robot meant to educate children through a mixture of storytelling, challenges and latest technology. It comes equipped with a variety of sensors that allow it to see, hear, feel the touch, distinguish between light and dark, measure proximity and more. Programming language used by the robot is inspired by Scratch and Google Blockly, which makes it simple and digestible by even the youngest users. The robot comes with a paired application adjusted for both smartphones and tablets. Here, children learn the story of Photon – a little robot whose flying saucer crashed on earth. By completing coding related tasks they help him gain his senses back, and rebuild his spaceship. App encourages friendly competition and cooperation thanks to the inclusion of high scores, leaderboards and daily tasks. Experience points gained by progressing allow kids to customize their robot and decide the order in which he develops, making each unit unique. “In four years there will be a gap of over a million computing jobs and candidates available for grabbing” says Marcin Joka, the CEO of Photon Entertainment. “We want to take part in closing that gap and proving that with a proper set of tools even a six year old can successfully learn how to code, and have a huge advantage in his or her future career”. The idea for creating Photon comes from minds of Marcin Joka, Krzysztof Dziemańczuk, Michał Bogucki and Maciej Kopczyński, four students and one academic lecturer form Bialystok University of Technology, Poland. The creators have received numerous distinctions and honorable mentions for their work. One of team members took part in creating an award winning Mars Rover Hyperion 2. Dieser Eintrag wurde veröffentlicht in Crowdfunding, English, General und verschlagwortet mit Kickstarter, Kids, Photon von Sebastian Trella. Permanenter Link zum Eintrag.